Staffing agencies should perform background checks on the candidates they place. According to the American Staffing Association, companies across the U.S. hire nearly 15 million temporary and contract workers each year. Nine out of 10 of people who get a job through a staffing firm said the agency makes them more employable. As businesses grow more competitive and the average job becomes more complex, many people suspect companies will increasingly turn to staffing agencies to fill open positions. After all, this allows their HR departments to work on other matters, and the business itself can better organize roles as needed. With so many people being filtered through these organizations, agencies must take care to make sure they are placing the right candidates. Although the average tenure of a temporary employee is just three months, a person can do serious damage to a business's reputation within that time frame. Vetting candidates ahead of their start date helps staffing agencies place the right person with the right company. That said, not all background screening vendors are created equal. Staffing agencies need an experienced, credentialed partner that understands time is money and helps you place candidates fast. In short, they need Orange Tree. Do staffing agencies screen candidates well enough? The short answer to the above question depends on the vendor they choose. Staffing agencies best serve the needs of their clients when they conduct comprehensive background checks on the candidates they place. While a brief criminal search works for some positions, others - like those dealing with sensitive populations (children, the disabled, the elderly, etc.) or where security is an issue (banking, government contractors, etc.) - need multi-database background checks regardless of the duration of the position or other hiring terms. This can present a problem, as the numerous resources and intricacies of a background check can be too much for some vendors. What's more, not every position requires the same screening process. For example, a background check for a temporary truck driving position isn't the same for a contract graphic designer and vice versa. But some background screening companies try to take the easy way out, shoehorning every applicant through the same process regardless of whether or not it applies to their position. Others lack consistency, performing background checks that don't align with the screening processes of the company with which the candidate is placed. This is why staffing agencies should partner with a certified third-party background screening service that can customize each and every search. Orange Tree handles all the work of designing and performing a background check, freeing agency employees to focus on other tasks. Orange Tree helps staffing agencies better serve their clients. What should agencies look for in a background check partner? Speed is of the utmost importance for staffing agencies. The faster they fill an open position, the sooner they can bill the client and free up workloads for more placements. Therefore, they need a screening partner that can quickly perform criminal searches and process background information within a limited time. Orange Tree performs background checks quickly and efficiently, ensuring firms get results in a timely manner. Additionally, our industry-leading candidate portal CandidateConnect keeps job-seekers engaged throughout the screening process, automatically prompting them for any missing information. 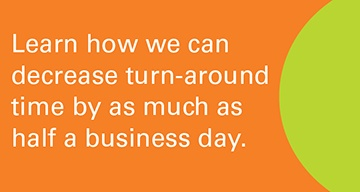 This further decreases time-to-hire by half a day. "A good screening vendor tailors its services based on the position." Does a temporary manufacturing employee need the same background check as a contract software engineer? Probably not, which is why a good screening vendor tailors its services based on the position. First Look: Performs a simple criminal check, making it ideal for identifying potentially harmful candidates. This package is suitable for lower-level positions like seasonal staff and hotel guest services. Basic Look: A slightly more thorough screen, Basic Look is good for positions where employees can access company assets or customers - think key holders or customer service teams. Intermediate Look: A thorough check for public-facing positions, this screening package is good for at-home installation staff, engineers and salespeople. Specialty Look: Designed to screen candidates who could present the greatest risk to a company, the Specialty Look is suitable for nursing roles and positions of similar importance. In addition, Orange Tree can create custom screening packages for any candidate, position or client requirement. One staffing agency found almost half of workers know someone who lied on their resume. Furthermore, more than half of senior managers have had suspicions about the accuracy of a resume in the past. This is why agencies should make sure their background screening vendor pulls data from a number of databases. In addition to national and statewide criminal records, Orange Tree can also search terrorist watch lists and verify education, licenses, prior employment and more. Integrating with the staffing agency's applicant tracking system is another way a screening vendor helps such organizations save time. Integration keeps workflows simple, as agency employees can complete nearly all of their tasks from one software program. Orange Tree has partnered with Bullhorn, the industry-leading ATS solution for staffing agencies, to keep the background check process as convenient as possible. A poor background check process can cause the perfect candidate to reconsider the position in question. That's why you want a screening partner that also focuses on reducing friction for all parties, not just you or your clients. Orange Tree's CandidateConnect makes it easy for candidates to submit the necessary background check information straight from their mobile device. What's more, text/email alerts and ETAs keep them engaged through every stage of the process. 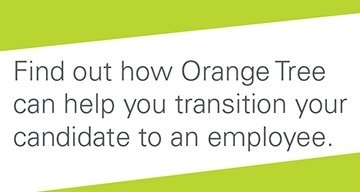 Interested in learning how Orange Tree can help your staffing agency? Get in touch to learn about our partnerships!